Flamewaker without steroids, should be still quite good in tempo mage, Flamewaker was broken. As a tempo mage fan I really like this expansion. It can only hit minions it's both a blessing and a curse.. I mean sometimes you really want to kill their minions unless vs control.. there this card is not great.. but saw this card in action on stream it was kidna MEH tbh it took his whole hand to clear an average board. This is not close to Flamewaker level (which is not a good card in Wild.) 1 mana Mana Wyrm was a very important wingman for him, it would be good in standard but still not enough to break odd-mage as the options for synergy spells would be so limited. This + Flamewaker in Wild... brb must call my therapist. 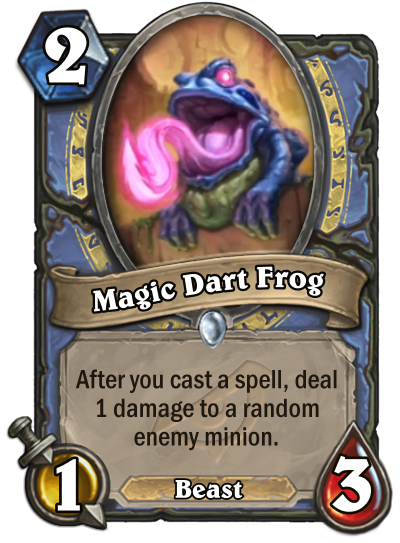 Is the card art based on the old zuma game, frog shooting marbles but now random damage. It's not as powerful as Flamewaker, but, on the other hand, Flamewaker never shared standard with Stargazer Luna. All this Flamewaker talk is irrelevant. This meta will be nothing like the Blackrock meta. In the Year of the Dragon, Mage has access to tons of cheap, flexible spells and staggering amounts of spell generation. And don't forget that in many cases, you absolutely did not want Flamewaker to hit face; you wanted it to clear minions. This little guy will never miss those minions. It seems to be a beast. Hunter can discover it then let the shenanigans begin. That's my answer, what have you come up with?